Refines the grain of skin and mattifies. 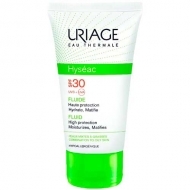 DESCRIPTION: Hyséac K18 Soin Désincrustant from Uriage is a regulating sebum care. Formulated with Uriage Thermal Water, Alpha-hydroxy acids complex, Licorice Extract, Piroctona Olamine, salicylate Fitosfingosina and mattifying powders, descales, refines the grain of skin and mattifies. The skin is clean and free of imperfections. Hypoallergenic and non-comedogenic. -56% blackheads after 3 months. * * Study carried out under dermatological control on 40 subjects. Apply 1 to 2 times per day to clean dry skin. Avoid contact with eyes. In the case of sun exposure apply Hyséac fluide SPF 30 or SPF 50 +.